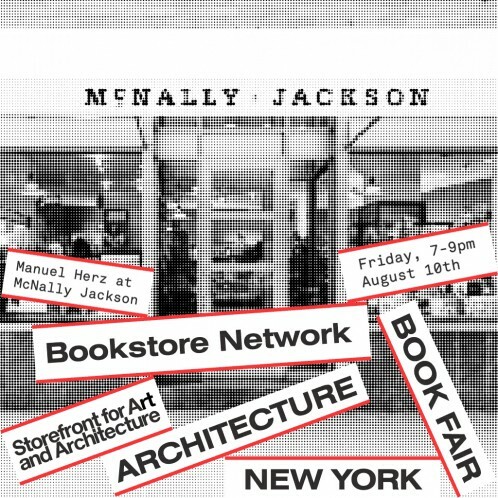 As part of the inaugural New York Architecture Book Fair, Storefront for Art and Architecture, McNally Jackson, and the Consulate General of Switzerland in New York present an evening with architect Manuel Herz on the integral response of architectural theory and practice to global migration. As part of the book fair, Herz has curated a selection of titles on display at McNally Jackson throughout the summer. The selection aims to provide an understanding of how the context of refugees and their global movement lies at the very heart of the architectural discipline, reflecting upon issues of control, authority, use, and production of space. It is organized into seven categories: the figure of the refugee; spaces of camps and forced displacement; debates on control and power; humanitarian action and its contradictions; architecture as critical agency; architectural and urban applications; and narratives of displacement. In “We Refugees,” Hannah Arendt states “Refugees driven from country to country represent the vanguard of their peoples.” Refugees are active agents, a new avant-garde that has the potential to transform society. Herz invites us to use this understanding to question the very foundations of our architecture. Manuel Herz is an architect whose research focuses on the relationship between the discipline of planning and (state) power. He has worked extensively on the architecture and urbanism of refugee camps, with a regional focus on Saharan and sub-Saharan Africa. His book From Camp to City—Refugee Camps of the Western Sahara documents how camps can be spaces of social emancipation and are used to prefigure the institutions of a nation by a refugee population living in exile. He was the curator and architect of the National Pavilion of the Western Sahara at the Venice Biennale of Architecture 2016. His award-winning book African Modernism—Architecture of Independence presents the architecture of countries such as Ghana, Senegal, Côte d’Ivoire, Kenya, and Zambia at the time of their independence in the 1960s and 1970s. The accompanying exhibition, shown at the Vitra Design Museum, is currently travelling to cities across Europe, the United States, and sub-Saharan Africa. Winner of several prizes, including the German Facade Prize 2011, the Cologne Architecture Prize 2003, the German Architecture Prize for Concrete in 2004, and a nomination for the Mies van der Rohe Prize for European Architecture in 2011, Herz’s Basel based office is responsible for the construction of the Jewish Community Center of Mainz and several housing projects across Europe. Manuel Herz studied at the Architectural Association in London. He taught at the Bartlett School of Architecture, London, the Berlage Institute, Rotterdam and Harvard Graduate School of Design, and was the head of teaching and research at ETH Studio Basel – Institute of the Contemporary City. Most recently, he has been appointed professor of architectural and urban design at the University of Basel. Reflecting upon the monographs, history and theory books, edited volumes, essays, and compilations that comprise our libraries and bookstores, one wonders: which architecture books have we produced that should constitute the foundations of our contemporary context? With an archeological and projective twist, the first edition of the New York Architecture Book Fair seeks to celebrate and evaluate both the existing and the missing volumes of a history still in the writing. Alongside an exhibition at its Soho gallery space, Storefront for Art and Architecture has partnered with independent bookstores throughout the city to present a series of pop-up architecture book collections. Each pop-up is curated by an emerging international architect. Together, they aim to reinforce the existing network of spaces in the city dedicated to the dissemination of culture and invite us all to expand our understanding of architecture books and publications that which we know. To learn more about the New York Architecture Book Fair and participating bookstores, visit www.storefrontnews.org. All Storefront events are free and open to the public. Seating is on a first come, first served basis, with priority seating available for members of Storefront. If you are a member, you can RSVP to reserve a spot. Bookstore Network: Manuel Herz at McNally Jackson – Refugees, Migration, and Architecture is a program in partnership with the Consulate General of Switzerland in New York and McNally Jackson. The first edition of the New York Architecture Book Fair is supported by the New York Architecture Book Club, an invitation-based network of individuals and firms that serve as the key group behind the book fair. For a full list of members, see here. Architecture Books – Yet to Be Written and the Bookstore Network are supported by the Royal Norwegian Consulate General, the Consulate General of Switzerland in New York, JESCO Lighting Group, Architectural Association Publications, ACTAR, Artbook | D.A.P., Dafne Editora, Harvard University Press, I. B. Tauris, Lars Müller Publishers, Park Books, Rizzoli Publications, University of California Press, University of Minnesota Press, Verso Books, Thames & Hudson, Reaktion Books, Editorial Gustavo Gili, Routledge Taylor & Francis Group, Marsilio,The MIT Press, The Monacelli Press, Tongji University Press, University of Chicago Press, Yale University Press, and Zone Books.